MIAMI (AP) — How do you measure a disaster like Florence? In sum, the storm is turning out to be every bit as devastating as forecasters expected, and it’s far from done, with trillions of gallons of rain in the forecast, hundreds of people needing rescue, nearly a million power outages and several deaths. Thousands of people have been told they still faced “imminent danger” from flooding. The economic toll remains to be tallied. —So far: Nearly 31 inches (79 centimeters) of rain was reported in Swansboro, on the North Carolina coast, and forecasters Saturday expected another 15 inches (nearly 40 centimeters) in parts of the Carolinas. Images captured by Associated Press journalists show flooded streets, uprooted trees, stranded residents and recovery crews in the aftermaths of Hurricane Florence and Typhoon Mangkhut. In North Carolina, a mother and infant died when a tree fell on their house, a 78-year-old man was electrocuted while plugging in a generator in the rain, a 77-year-old man died after being blown to the ground while checking on his hunting dogs, and a sheriff’s office said three people died because of “flash flooding and swift water on roadways.”. In South Carolina , a 61-year-old woman was killed when her vehicle hit a tree that had fallen across a highway. Thousands of people living within a mile (1.5 kilometers) of the banks of North Carolina’s Cape Fear River and Little River were ordered Saturday to evacuate because they faced “imminent danger” from flooding as river basins filled beyond their capacity. The evacuation zone included part of the city of Fayetteville, with a population of 200,000. Florence is testing the faith of people in the Bible Belt town of Lumberton, South Carolina , where people had to be rescued from rooftops after flooding caused by Hurricane Matthew two years ago. Lumberton’s manufacturing-based economy was withering for years before that, and local newspaper editor Donnie Douglas says he doesn’t know how much more suffering the traumatized residents can take. Dozens of polluted industrial sites, chemical plants, coastal shipyards and military bases are in Florence’s path, along with scores of low-lying water and sewage treatment plants at risk of flooding. Environmental groups are worried hog lagoons and coal ash dumps that could contaminate soils or rivers used as sources for drinking water. Long before President Donald Trump tossed paper towels to storm-stricken Puerto Ricans and denied Hurricane Maria’s reported death toll, his predecessors sometimes struggled to steer the nation through life-and-death emergencies. The Associated Press has fact checked some of the claims Trump made about Maria and the economy this week. Trump will travel next week to areas hit by Florence. Reporters for The Associated Press, the news site Quartz and Puerto Rico’s Center for Investigative Journalism have compiled the most detailed portrait yet of the agonizing final days of victims of Hurricane Maria , interviewing 204 families of the dead and reviewing accounts of 283 more to tell the stories of heretofore anonymous victims. The 470-mile (750-kilometer) Blue Ridge Parkway that winds through the Appalachians in Virginia and North Carolina closed at 8 p.m. Friday to vehicles, cyclists and pedestrians until further notice because of expected high winds and heavy rains. Hikers have been told to seek shelter off the Appalachian Trail to avoid falling trees, flash floods and mudslides. 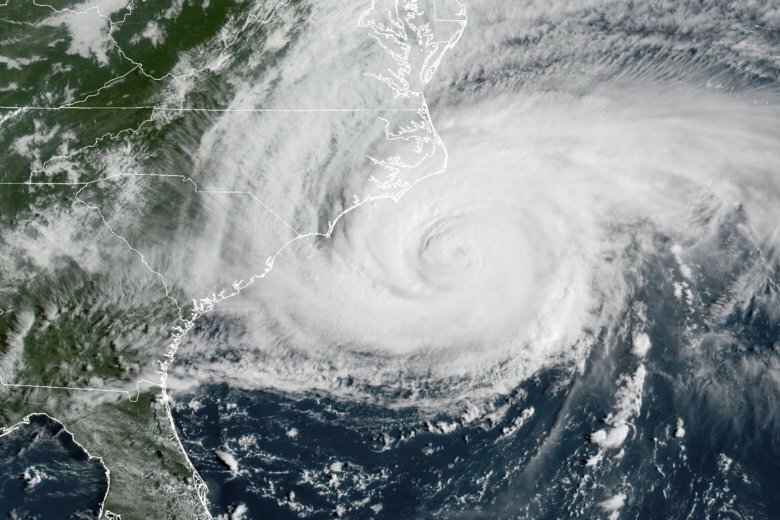 Torrential rains from Florence will test South Carolina’s infrastructure , which failed under nearly 2 feet (60 centimeters) of rain in 2015. A year later, flooding from Hurricane Matthew caused about 25 dams to fail. More than 3,000 maintenance workers are on standby statewide to fix broken traffic signals, barricade problem areas and make roads safe again. Basketball great Michael Jordan, who grew up in North Carolina and owns the NBA’s Charlotte Hornets, and new Carolina Panthers owner David Tepper are providing relief to those affected by Florence. Jordan said it’s “devastating” to see the damage, and his organization and the NBA are “here to help.” In a tweet , Tepper said the Panthers are working with charities to develop a response plan. A family rescued from their New Jersey home by boat during Superstorm Sandy in 2012 is waiting to find out whether Florence took their new one in North Carolina. Rather than rebuild in Union Beach, New Jersey, the Liebelt family decided to start over in Wilmington, North Carolina. Typhoon Mangkhut set off landslides and destroyed homes in the Philippines, killing at least 12 people and prompting more evacuations as it turned toward southern China. Determining the role climate change plays in storms like Florence and Mangkhut is complicated, experts tell the AP. In the Atlantic Ocean, the Azores could get gusty winds and heavy rains from Tropical Storm Helene, and Ireland and the United Kingdom could get hit with the storm’s remnants early next week. Tailgaters only had one choice for a college football game Saturday in the Carolinas and Virginia. No. 2 Clemson and Georgia Southern got a sunny sky in Clemson, South Carolina, while every other major school in the region called off or relocated games because of Florence.